Actor/Director Clint Eastwood (Million Dollar Baby) has done it again! 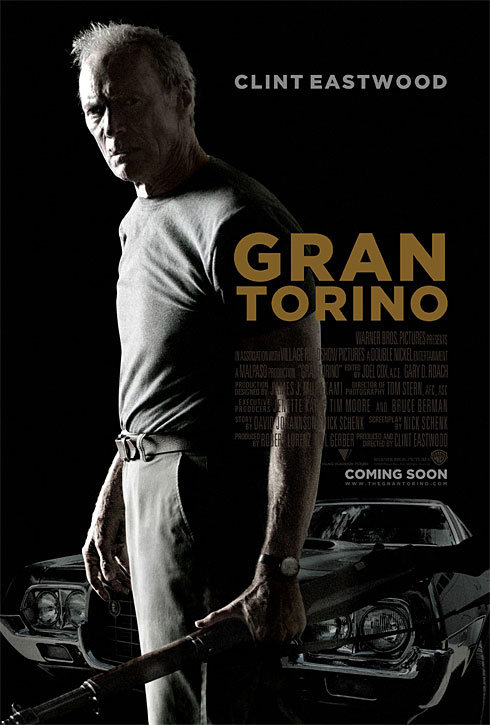 A mere two months after the release of his excellent previous directing effort Changeling comes Gran Torino, a film which might perhaps be Eastwood’s last outing as an actor according to the man himself. The film will premiere in the US on limited release on December 12th before going wide on January 16th. Warner Bros is already pushing the film for serious award consideration, as can be seen here. The script was written by newcomers Nick Schenk and Dave Johannson. Eastwood stars as a racist Korean War veteran who is disgusted by the amount of Asian people who have moved in his neighborhood. However, when he stops a young Asian kid from stealing his Ford Gran Torino as part of gang initiation one day, the boy is forced by his family to work for him as penance. A friendship eventually forms between the two. I personally think it looks superbly awesome, and one must admire all the Asian actors, for most of whom this is the first film. As I said earlier, another surefire bonafide great piece of cinema from a man that can only be called a master. What do you think? Tell me below in the comments. This entry was posted in American Films, Movie Trailers, Videos and tagged Changeling, Clint Eastwood, Dave Johannson, Ford Torino, Gran Torino, Hmong, Korean War, Million Dollar Baby, Nick Schenk, Warner Bros by Mr Hollywood. Bookmark the permalink.